Pedagogies of Engagement: Resource Collections > SCALE-UP > What is SCALE-UP? SCALE-UP stands for "Student-Centered Active Learning Environment for Undergraduate Programs." SCALE-UP facilitates active learning in redesigned studio classrooms and has been effectively implemented for large enrollment classes of up to 117 students to date. The name was originally "Student-Centered Activities for Large Enrollment Undergraduate Physics" but since then, many different institutions that have adopted SCALE-UP teach a variety of courses of varying enrollment sizes. There is no separate lab class and most of the "lectures" are class-wide discussions. A decade of research on the SCALE-UP pedagogy indicates significant improvements in student learning over traditional courses with separate lecture and lab. At first glance, the teaching spaces look more like restaurants than classrooms. 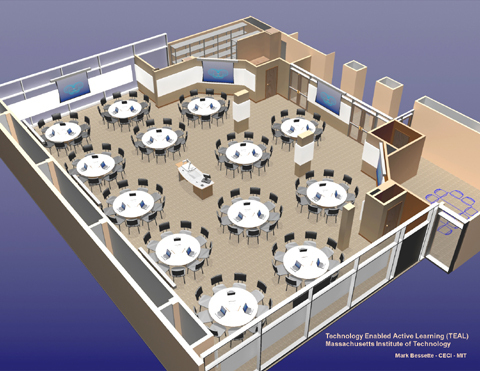 These spaces are carefully designed to facilitate interactions between teams of students who are engaged in "tangibles" and "ponderables". Essentially these are short, hands-on activities, simulations, or interesting questions and problems. While students work in teams, the instructor is free to roam around the classroom--asking questions, sending one team to help another, or asking why different teams got a different answer. Some "lecturing" is used to provide motivation and a view of the "big picture", which is difficult for students to see when they are not familiar with the entire course content.